Among Wesa’s credits over the years, she are performances for the likes of the Queen of England, Prince Edward, the Zimbabwean president, the President of South Africa and in 2007 George Bush Senior and Bono of U2 when he was receiving his Liberty Medal at the National Constitution Center in Philadelphia and, Performed at the launch of the Portland Blazers player Nicholas Batum’s foundation “Mamas of Africa”, sharing the stage with Khanye west, Wutang Clan and many more. Loveness Wea's music is rooted in the exotic culture of Zimbabwe will tickle your soul, sweep you into a swirl of unexpected energy and tease you into shaking off the dust of daily turmoil. The rolicking African sound of Loveness Wesa – driven by the beat of inspired musicians in the Bantus Band – is AFRO-POP and it takes you to a happy place. That happy place is now here in Portland, where Wesa has made her home after sharing her gifts of music and dance on tours around the globe; in Australia, Europe, Canada, Africa and the U.S. Among Wesa’s credits over the years, she lists performances for the likes of the Queen of England, Prince Edward, the Zimbabwean president, the President of South Africa and in 2007 George Bush Senior and Bono of U2 when he was receiving his Liberty Medal at the National Constitution Center in Philadelphia and, Performed at the launch of the Portland Blazers player Nicholas Batum’s foundation “Mamas of Africa”, sharing the stage with Khanye west, Wutang Clan and many more. 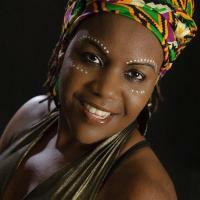 Wesa t is the first female artist in Zimbabwe to write, choreograph, direct and produce dance theatre shows performed mostly by women. And she has been daring enough to play traditional drums in her act, defying a taboo in her homeland that once denied women in her culture a place behind a drum. Loveness sees her style of entertainment as a vehicle to spread a message of peace, freedom and understanding. Her music was inspired by her mother, aunt and grandmother who were Sangomas – spiritual mediums who used song and dance to channel ancestral spirits. Wesa’s sound merges ancient traditions with a modern twist and is adapted to both traditional and contemporary instruments. Listen closely and you’ll hear the influences of musical legends including Miriam Makeba and Harry Belafonte. Like Loveness, who danced endlessly as a child, her own 10 year old daughter, Shalom, adds sparkle to their stage performances. The 5th grader is a savvy entertainment vet who has been performing since she was 3. If you can’t catch their act, Loveness Wesa CDs are available at www.lovenesswesa.com cdbaby.com and bantusband.com.